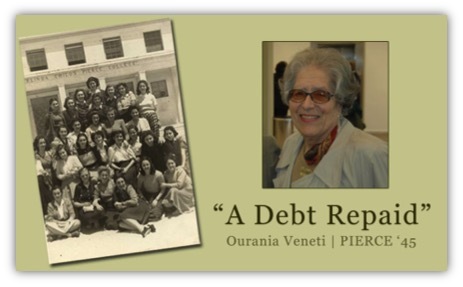 Ourania Veneti graduated from Pierce – The American College of Greece in 1945, and for decades she had no contact with the school. After 15 years of study and work in the U.S. she returned to Greece in 1964 where the requirements of everyday life, kept a visit to her alma mater in the vague sphere of future plans. Meanwhile, the school moved from its idyllic seaside campus in Helleniko to its present mountainside location in Aghia Paraskevi; a move that provided new facilities and the opportunity for future growth, but inevitably diminished the emotional impact of a visit in the eyes of the Helleniko graduates. For Ms. Veneti, the separation lasted until June 30, 2011, when the College organized a large and moving reunion for its Helleniko graduates at their beloved campus (which now houses Greece’s Civil Aviation Authority). When Ms. Veneti returned to the locus of her teenage dreams, her affection for the College was restored. 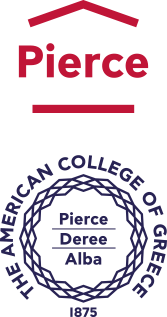 Soon after, Ourania Veneti crossed the gate of the Aghia Paraskevi campus, visited the Office of Development and gifted $10,000 – a significant part of her pension income – in support of Pierce students. Her goal is to keep supporting students for as long as circumstances allow her, she said. Ms. Veneti told ACG staff that her gift signified more than a reunion with her school. It was the fulfillment of a debt she owed Pierce. For Ms. Veneti, Pierce was the key to a vault of moral and spiritual values. During a moving meeting that took place in late March with the three Pierce students who are benefiting from her scholarship support, Ms. Veneti encouraged the students to persevere despite all current difficulties, reminding them that her generation, too, went through immense travails – war, occupation, abject poverty – but that thirst for life and knowledge triumphed over time, as they inevitably do. She also urged the students to draw life lessons from their school and the values it represents. These values, she said, have been her guide ever since she stepped foot in a Pierce classroom in Nazi-occupied Athens. “Sas efharisto!” (thank you!) she kept telling the three students, as if she were the greatest beneficiary of her own generosity.